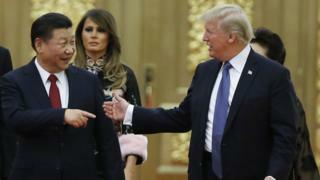 China has condemned the "Cold War mentality" of the White House after the publication of a new US national security policy. The document labels China and Russia as "rival powers" and lays out a number of potential threats they pose. But China's foreign ministry criticised the strategy report, saying Washington should "abandon outdated notions". Spokeswoman Hua Chunying said: "No country or report will succeed in distorting facts or deploying malicious slander. "We urge the US side to stop intentionally distorting China's strategic intentions and to abandon outdated ideas of Cold War mentality and the zero-sum game." Russia also responded to the new strategy by saying it "cannot accept" that it is treated as a threat. It also criticised what it said was the "imperialist character" of the document. In the new US national security strategy, China and Russia are said to "challenge American power, influence and interests, attempting to erode American security and prosperity". "They are determined to make economies less free and less fair, to grow their militaries, and to control information and data to repress their societies and expand their influence." Competitors such as China "steal US intellectual property valued at hundreds of billions of dollars"
In Europe, China is gaining a foothold "by expanding its unfair trade practices and investing in key industries"
China also "seeks to pull the [Central America] region into its orbit through state-led investments and loans"
First at his golf club in Florida, then at the Forbidden City in Beijing, President Trump has taken every opportunity to say how close a friendship he's built with his Chinese counterpart Xi Jinping. But now the official version is rivals - not friends. The classification sends a clear message about America's changing stance towards a rising China, a China that's made no secret of its plan to significantly expand its navy, assert more regional authority and expand its influence further abroad through a massive state-backed investment push. Economic rivalry is crucial to this dynamic. The Trump administration is investigating China for what it alleges is the dumping of artificially cheap aluminium products on US markets. It has threatened to do the same on steel exports. Ahead of the document's publication, there were reports that the National Security Strategy would classify China as an economic "aggressor", but that did not appear in the final version. 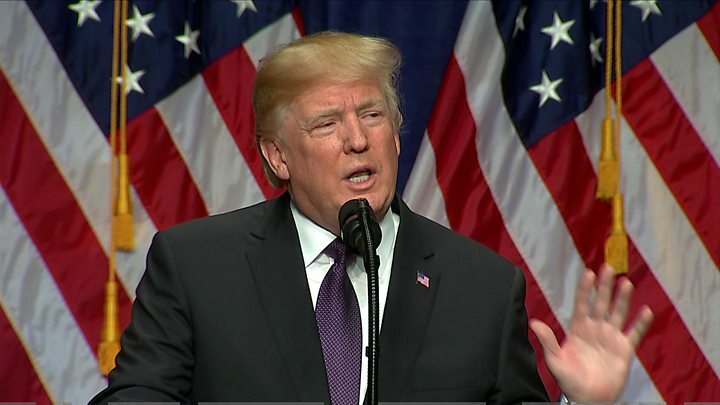 In a speech about his new strategy, Mr Trump said the US faced a new era of competition, and that China and Russia were the primary threats to US economic dominance. But, he said, the US must attempt to build a "great partnership with them". Mr Trump described "four pillars" to his new plan: protecting the homeland, promoting American prosperity, demonstrating peace through strength and advancing American influence. The 68-page document, which White House officials began work on 11 months ago, suggests a return to Mr Trump's campaign promise of "America First". 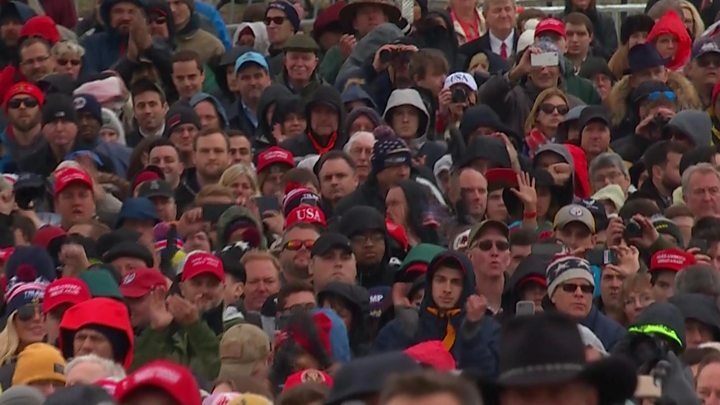 In his speech, Mr Trump referred to his election victory, saying that in 2016 voters chose to "Make America Great Again". Previous American leaders had "drifted" and "lost sight of America's destiny" he said, standing before a backdrop of American flags. "Now less than one year later I am proud to report that the entire world has heard the news and has seen the signs," he said. "America is coming back and America is coming back strong." The new policy stresses economic security but does not recognise climate change as a national security threat. His predecessor, Barack Obama, in 2015 declared climate change an "urgent and growing threat to our national security".